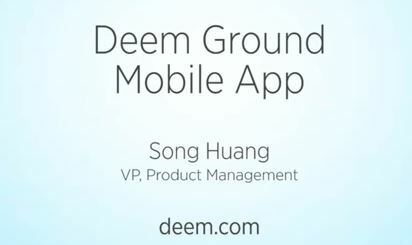 OK, so you have created a great mobile application and you want to show it off to the world. How can you be sure that potential users see it in the light that you want, hitting all the key points? Well nothing beats a video demo. If you’ve called a professional video production house, you’ll soon find that it’s too expensive! It’s not uncommon to spend $1,000 plus on a video demo. Well, there’s a better way. 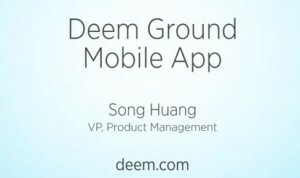 As the Vice President of Product Management for Mobile at Deem, I managed the team creating all kinds of great mobile applications. We had apps for booking travel (hotel and ground transportation) as well as expense reporting and local offers. We wanted to create great videos and we figured out how to do it for pretty cheap. Here’s an example below before I describe what we did. This application is used when you want to book a ride with a "Black Car" service right from your mobile phone. So we took a wooden plank and installed a pipe fitting into it. At the end of the fitting we put some suction cups. 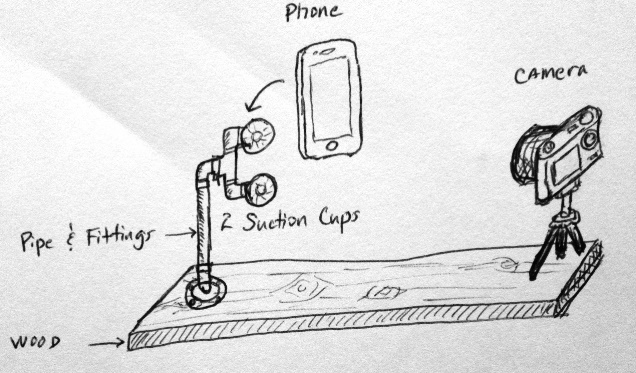 To the suction cups, we attached the smartphone. At the other end of the plank, we simply took a tabletop tripod and mounted a digital camera that had HD video capabilities. Here’s a quick sketch of the setup. 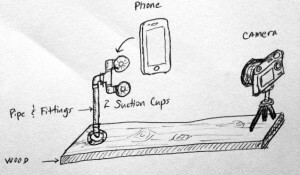 Simple mounting system for the phone video recording. Now, I installed the finished application on my phone and then wrote a quick script in a scene by scene format. To capture the video, we simply turned on recording while I ran through the demo! Did you notice the nice blurry background? Every once in a while you’ll see someone walk past. We recorded the video in a conference room and simply had the normal office activity as the background. By using a very narrow depth of field on the camera, we got the background to be blurry. Simple huh? There were two things in the video that required a professional. First, we had the “bumpers” created. These are the intro and exit animations. Second, was the post production work in overlaying the bullets, matching the recording to the sounds and finally adding the bumpers. Oh, I should mention that since I wrote the demos and was the “voice talent”, that part was basically free. So how much did all this cost? Script and voice talent – free! OK, so this is still a bit of an investment. However compare this to a professional video production house and I think you’ll see it was a bargain. Besides, you can re-use many of the parts and then you’ll only have to worry about the post production bucks. Having a nice professional video helps to establish your brand, educate existing users and attract new customers. It’s also how people expect to see things these days. I mean, who reads manuals?